This is a very beautiful photo with spectacular colors! Handsome drake - but when are they not. Nice picture. A handsome duck indeed... he is a nicely colored drake for sure! And you spontaneously pushed the camera button, looks good ! This is such a beautiful picture of the Mallard, and I like the one in the corner of the photo too. I love mallards, such a beautiful green. Nice photo. There's one in the lower corner too. There always seems to be one other duck who likes to get in the picture. Showing off its back proudly! Very pretty colors on its head and neck. Nice critter shot. I believe this is a Mallard and his mate. Very beautiful picture. What a beautiful duck photo! I love it!! I haven't been that close to a duck in a while. Gorgeous! Thanks for visiting my camera critters yesterday! Very beautiful. We do not have many mallards stopping at ponds around here. 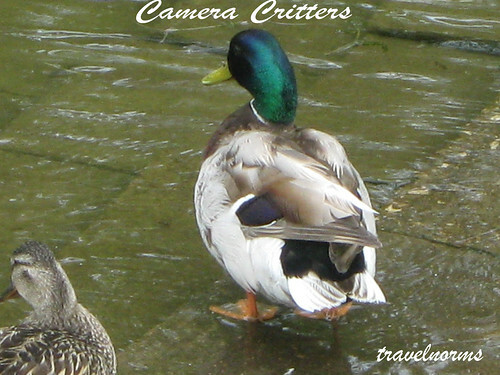 A great Mallard photo and wow, Toronto Center Island! I used to visit there in the summers during the 80's with my family. Thanks for your visit. I love the colors of the duck. Pretty.